Domingo played for Aurillac before becoming a mainstay for Clermont Auvergne. 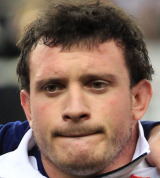 Strong performances for Clermont led to a call up to the French national side and he made his international bow against Wales during the 2009 Six Nations. As a formidable scrummager, thanks largely to his squat, powerful stature, Domingo quickly established himself as a regular feature of the French team and racked up 17 appearances in his first two years of international rugby. At club level, Domingo's rise coincided with a rich period for the French club as they reached the final of the Top 14 three times in a row before finally winning the title on the fourth attempt in 2010. In 2011 Domingo was one of the few plus points to emerge from a difficult Six Nations for France, but a knee ligament injury sustained on club duty put him out of action prior to the Rugby World Cup, where he would have been a squad certainty.